Firstly, what’s so healthy about seeds? They are high in healthy fats, gluten free, have high protein content, and they are full of other nutrients. Seeds are also super easy to add to dishes you already eat. This makes it simple to add some nutrition to the dishes that are already staples for any household. Seeds are also almost always raw when purchased. This means that you could be adding raw foods to your diet instantly. Raw seeds (and nuts) have a fantastic shelf life. There have been some discoveries of ancient seeds that were still able to sprout hundreds of years later. We really don’t recommend looking for old seeds, especially because we think the fresh ones taste better. 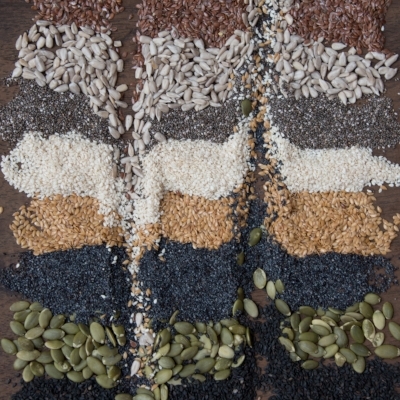 Because seeds are raw, they are a great ingredient. Toasting seeds can be a good way to get some of the hidden flavor out of the seed and is also quick and easy to do. Napa Nuts recommends throwing a single layer of seeds onto the tray of a toaster oven. Put them on a standard toasting cycle, but keep a close eye on them. Usually when they start to become fragrant, they are done. Beware of over-toasting, as seeds can quickly transition from toasted to burnt. For a bit more control, seeds can also be added to a dry frying pan over medium low heat. Stir continuously or move the pan to make sure heat does not concentrate in any one spot. If you start to hear popping, remove the seeds from the heat. Sunflower seeds as a salad topping: Great to add a bit of crunch, some healthy fats, and a nice toasty flavor that compliments lettuces really well. Chia pudding: Mixing chia seeds and any milk (dairy or non-dairy) is a fun way to make pudding. Chia seeds make their own gelatin and thicken with no other additives. We then enjoy putting fresh fruit, honey, or other toasted nuts on top to make parfaits. Sesame seeds as a garnish: Adding just a sprinkle of seeds on rice adds nice color and flavor. We offer both black and white sesame seeds and recommend a mix as a vegetable topping. The colors contrast beautifully. Hemp seeds on avocado toast: Avocado toast is the new thing, but adding a sprinkle of hemp seeds on top adds a complete plant protein to the mix. Delicious meets nutritious. What are your ideas? Leave us some comments with other seed suggestions.